I read with interest the recent article by Chen et al entitled, “Sonographic Characteristic of the Cavum Velum Interpositum” (1). The regional anatomy of the cavum veli interpositi is complex and difficult to understand. I would like to point out the following anatomic information that is in variance with some of the statements made in the above-mentioned publication. The ependymal roof of the third ventricle is covered by a double layer of pia mater, the tela choroidea (2). The embryologic basis for this double-layered tela choroidea was outlined diagrammatically in 1932 by Frazer (3), modified by Brash (4), and reproduced in the neuroradiologic literature (5). It results from the overlapping of the third ventricle by the enlarging forebrain (Fig). During an early fetal stage, the prosencephalon and diencephalon are covered by a continuous layer of pia matter. With further brain development, the expanding cerebral vesicles of the forebrain, covered by its own pia mater, overlap the pia mater of the third ventricle, resulting in the double-layered tela choroidea (velum interpositum) of the roof of the third ventricle. The anterior aspect of the tela choiroidea, which is closed, is at the interventricular foramen where the pia mater folds on itself. When the posterior end remains open, the potential space between the double layers of the tela choroidea forms the cavum veli interpositi that communicates with the quadrigeminal cistern. The internal cerebral veins are located between the two layers of the cavum veli interpositi (2). Certain human embryologic changes are a “recapitulation” of evolutionary modifications. Therefore, examining the changing anatomy of various adult vertebrate brains facilitates understanding the overlapping of the third ventricle by the expanding human fetal cerebrum (5). In the shark's linear brain, the cerebrum is anterior to the diencephalon. FIG. 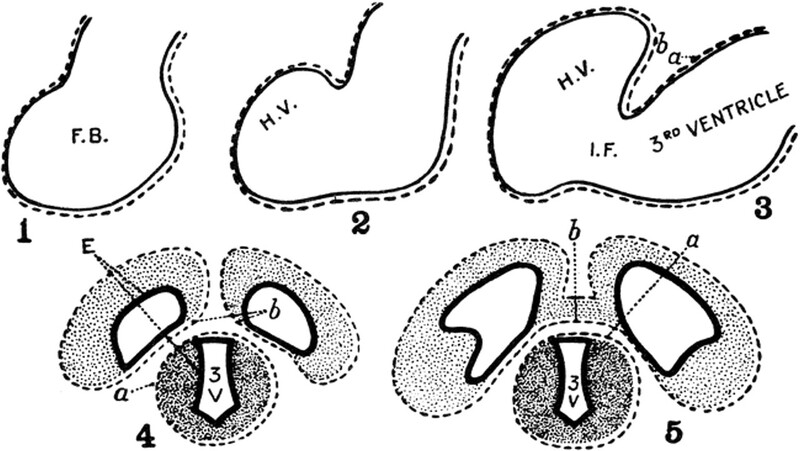 Diagram demonstrating the formation of the double-layered tela choroidea (velum interpositum) of the third ventricle in the human. 1) The developing neural tube includes the forebrain (FB) which is surrounded by the pia matter (broken line). 2) and 3) the expanding vesicle of the cerebral hemisphere (HV) carries its own pia mater (b) which overlaps the pia mater (a) of the third ventricle. IF signifies intraventricular foramen. 4) A double layer of pia mater (b, a) is interposed between the two cerebral vesicles and the third ventricle (3V). E signifies ependyma. 5) The two layers of pia mater (b, a) over the third ventricle persist after connection of the hemispheres by the commissures. Permission for use of the figure was granted by T.H. Newton and Mosby-Year Book. The entire roof of the diencephalon (third ventricle) is visible, and consists of a single layer of pia mater covered by a prominent venous plexus. In reptiles and primates, the expanding cerebrum overlaps the diencephalon, resulting in the double-layered tela choroidea of the third ventricle. The velum interpositum is the double-layered tela choroidea of the third ventricle. The cavum veli interpositi is within the double-layered tela choroidea of the third ventricle, not superior to it. The internal cerebral veins are within the cavum veli interpositi, not inferior to it. The correct nomenclature is velum interpositum and cavum veli interpositi. Finally, a discussion of fluid-filled structures in the pineal region should include an enlarged suprapineal recess of the third ventricle. This recess may be quite large, and may extend posteriorly below the splenium (5, 6).